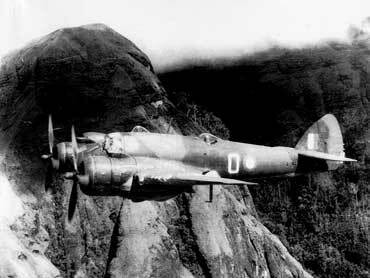 30 Squadron RAAF Beaufighter over Owen Stanleys Range on route to Buna to strafe barges, September 1942. (Courtesy 30 Squadron RAAF Assoc). Buna was a small village on the north coast of Papua and the administrative headquarters of the district. 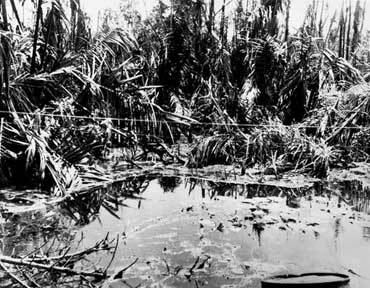 There were several coconut plantations but much of the area was cut by small creeks and interspersed with fetid swamps and jungle. After the Japanese landed on 21 and 22 July the area became a major supply base supporting their advance over the Kokoda Track for an overland attack on Port Moresby. Buna was to be the scene of grim fighting involving Australians from 18 December 1942 until 2 January 1943. As at Gona and Sanananda the Japanese had established a series of strongly constructed and fortified bunkers during October – November, 1942. These were well camouflaged and sited to provide mutual fire support. The positions defended the new and old airstrips and westwards right back to Buna village. The initial attack began on 19 November by two battalions of the 32nd U.S Division under command of General Harding and supported by 2 guns each of the 2/1st and 2/5th Australian Field Regiments. Despite sustaining heavy casualties, the US troops, known as Warren Force, made little progress. The 2/6th Australian Independent Company reported to the 1/128 US Battalion on 21 November in a supporting role and patrolled vigorously, finally being withdrawn from action on 11 December. Their casualties totalled at least 20 killed and 13 wounded.The American casualties for the period numbered almost 500. On 1 December General Eichelberger replaced General Harding. In early December Battalions of the 126th and 127th US Regiments were added to the troops of the 32nd Division already in action and gradually the Americans began to have success in which the Australian artillery played an important role. Air support was provided by numbers 4 and 30 Squadrons RAAF, by means of a radio hook up between ground forces, planes overhead and RAAF Headquarters at Popondetta. To reinforce the Americans, the Australian 18th Brigade, under Brigadier George Wootten was brought forward from the general area of Milne Bay in early December. Warren Force was then brought under Wootten’s command. Wootten’s main support troops were 8 tanks from the 2/6th Australian Armoured Regiment and 25 pounder artillery from the 2/1st and 2/5th Field Regiments plus some engineers and the 2/5th Field Ambulance. 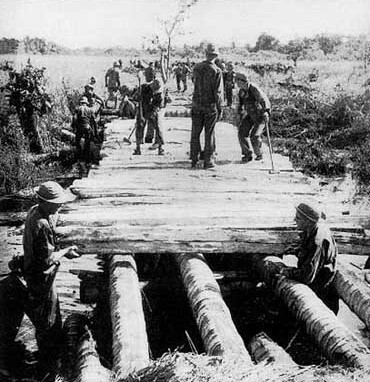 On 14 December the western American column known as Urbana Force entered Buna village after its Japanese defenders were ferried away at night. Two days later Wootten launched the first phase of a thrust from the east, aimed at capturing the area between two airfields dubbed “New Strip and “Old Strip” and the sea. On 18 December the 2/9th Battalion attacked at 7 am following an artillery barrage and immediately struck heavy opposition at New Strip, where it lost 11 officers and 160 men. Australians gained their first objective next day and continued to advance. Six days later this phase of the operation came to an end. The next phase, which began on 24 December, was carried forward by the 2/10th Battalion supported by the only four tanks which were still operational. A battalion of the 126 US Regiment, moving on its left flank also provided support. The advance began well but faltered under heavy fire which quickly accounted for all four tanks, however, 700 metres were finally gained. This was due in no small way to Private Timothy Hughes, an Aboriginal soldier of 2/10th Battalion, who silenced some key Japanese defence posts with grenades and tommy gun. For this action he was awarded a Military Medal. On 25 December a 25 pounder from the 2/5th Field Regiment, known as “Carson’s Gun”, was sited between the airstrips and west of the bridge over Simemi Creek, and created havoc in Japanese defensive posts. A former Japanese observation post in a 25 metre high banyan tree was established by Captain Tom Handran-Smith of 2/5th Field Regiment. Among those who manned this observation post was Major (later Sir) William Hall, the battery commander. An attempt to resume the advance on 29 December also foundered. On 1 January 1943 – after the arrival of a fresh battalion, the 2/12th, from Goodenough Island and six more tanks another effort was made. This attack swept through the open plantation, dealing with one Japanese bunker after another, and by 2 January had reached Giropa Point. In their short action the 2/12th lost 12 officers and 179 men. This completed the capture of the Buna area in conjunction with a fresh attack by Urbana Force which captured the old government station. The bloody operation had cost the Allies 2,870 battle casualties – 913 of whom were among Australian units. The 18 Brigade suffered 863 casualties including 306 killed. A minimum of 1,390 Japanese were killed – this number being counted bodies and exclusive of those killed or buried alive in destroyed structures. 900 of the enemy dead were in the sector under command of Brigadier Wootten. No more than 50 prisoners were taken which was stark testimony to the savagery of the fighting and the determination of the Japanese defenders to accept death rather than surrender.